Get organized with this dashing Catch-All dresser tray. 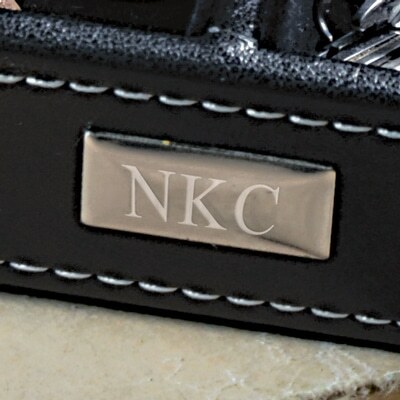 We’ll engrave with the recipient’s initials for no extra cost! Organization meets style with our Personalized Men’s Catch-All Dresser Tray. It goes perfectly on his dresser. 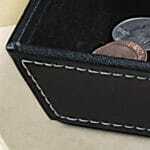 It can also be placed near the back door, in his office, or anywhere clutter can collect. 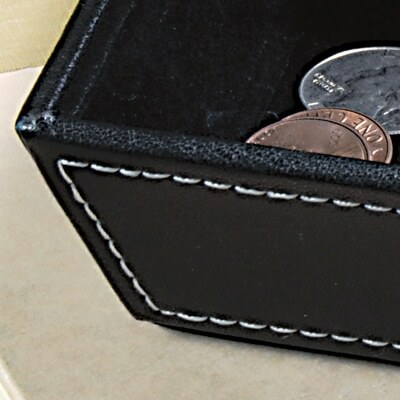 The compartmentalized tray is great for keeping all your important pocket gear, loose change, cuff links or sunglasses gathered. The tray is crafted of black leatherette with white stitching — and lined in black velveteen. Grab one for yourself or gift a set to your groomsmen. 7.5" x 7.5" x 1 1/2" deep. Crafted from leatherette and velveteen. Engraving is done on a brushed silver plate with adhesive backing for placement of your choice upon arrival.